MRPL Jobs Recruitment 2017 - Mangalore Refinery and Petrochemicals Limited Karnataka Has Published Job Advertisement For 74 Engineering Graduate Posts, Kindly Request To All Candidates That Read All Important Content Of This Job Carefully Before Applying For This Job And Last Date For This Job Is 19-10-2017. Qualification For This Job :- (B.E. / B.tech / B.Sc. (Engineering) + GATE - score card of 2017) Valid For This Job,For Whole Information About This Job Read Published Advertisement Copy given below this post. Selection Process :- For This Job (Shortlisting and Interview) On The Basis Performance of Candidates Selection Will Be Done. Find all latest MRPL Manglore Karnataka Govt Jobs Recruitment vacancies notification only in rojgar dhaba website. Latest upcoming vacancies in Indian Government jobs for the departments of Mangalore Refinery and Petrochemicals Limited open that given links to know more details. Please bookmark this page to attain all upcoming vacancies in Indian government. 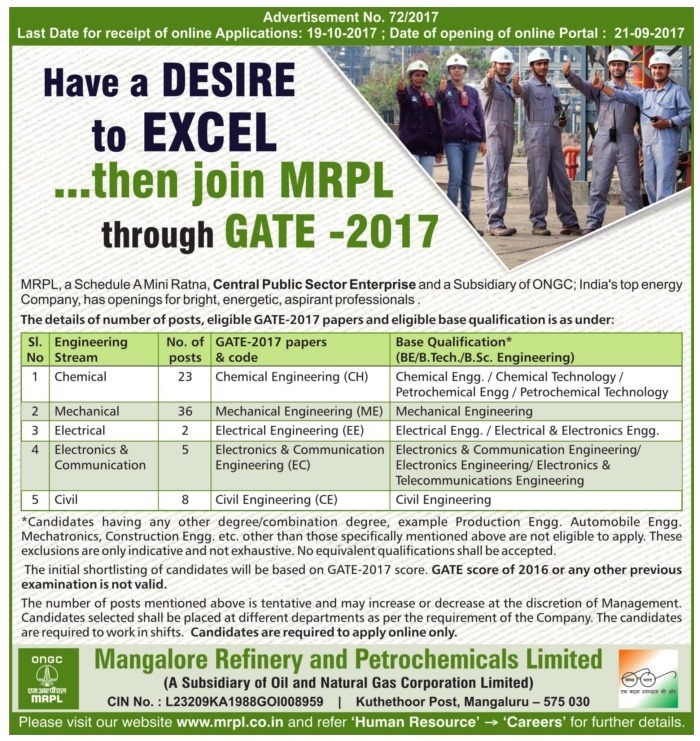 MRPL Jobs Recruitment 2017 - Mangalore Refinery and Petrochemicals Limited Karnataka Has Published Job Advertisement For 189 Graduate and Technician Apprentice Posts, Kindly Request To All Candidates That Read All Important Content Of This Job Carefully Before Applying For This Job And Last Date For This Job Is 07-10-2017. Qualification For This Job :- (Diploma / Degree (Engineering) / Diploma (Commercial Practice)) Valid For This Job,For Whole Information About This Job Read Published Advertisement Copy given below this post. Selection Process :- For This Job (Written Test and Document Verification) On The Basis of Performance of Candidates Selection Will Be Done. Find all latest MRPL Manglore Karnataka Recruitment vacancies notification only in rojgar dhaba website. Latest upcoming vacancies in Indian Government jobs for the departments of Mangalore Refinery and Petrochemicals Limited open that given links to know more details. Please bookmark this page to attain all upcoming vacancies in Indian government.